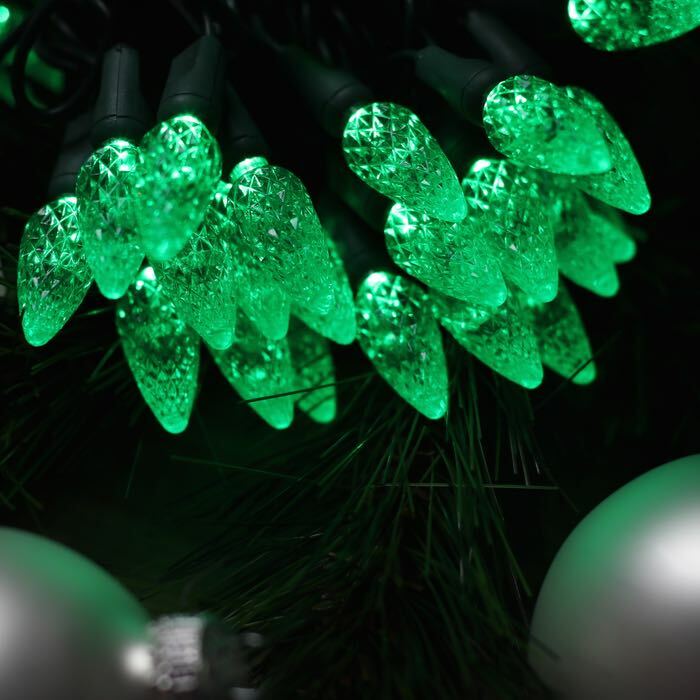 Check out the beautiful sparkle of these faceted green C6 LED Christmas lights! With the latest in lighting technology, these Christmas lights are easy to install and provide a virtually no-heat operation. These LED lenses are an ideal choice for your Christmas tree or holiday greenery. Combine this green with white or red for a festive addition to your indoor decorating. With 43 sets able to run in a series and 4 inches of spacing between lights, you will achieve maximum effect for your efforts when stringing lights this year. LED Christmas lights are both weather and moisture resistant and approved for indoor and outdoor use. What can I do with one string of Christmas Lights? We could not find these anywhere else and they are a fabulous green! If we ever need more, we know where to find them now. Thank you!